Medium Wave DXer Bjarne Mjelde has recently written up his experiences with the new Airspy HF+ software defined radio. If you weren't already aware, MW DXing is the art of attempting to receive extremely weak and distant broadcast AM stations which may be close to powerful local stations. Generally a radio with high end dynamic range specifications is required for this task. The HF+ is a new low cost SDR that aims to meet those very needs. In his review Bjarne noted that the MW band sensitivity of the HF+ was good, but not quite as good as the more expensive Perseus and Cloud-IQ SDRs. He also noted that the LW band was more attenuated than expected. However, he discovered that there is an optional hardware modification for the HF+ that involves simply bypassing a capacitor on the PCB with a short circuit. After performing this mod Bjarne found that the sensitivity was significantly improved on the MW and LW bands. Also although sensitivity above 15 MHz was expected to be reduced, Bjarne found no noticeable detrimental effects. Bjarne concludes that the HF+ is a very capable receiver that after modding satisfies the needs of a demanding MW DXer, although he does note the drawback of the limited 660 kHz of bandwidth. 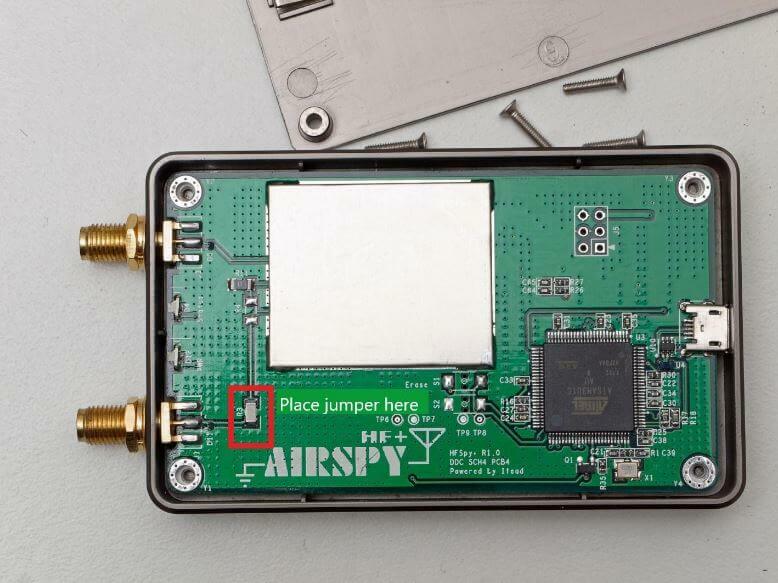 In other previous reviews of low cost SDRs on his blog, Bjarne reviewed the SDRplay RSP1A, ColibiriNano and the Airspy R2 + SpyVerter. Basically he found that none really satisfied his MW DXing needs, with the RSP1A being suprisingly good but failing with strong signals, the Airspy R2 + SpyVerter having too high of a noise floor, and the ColibriNANO being okay, but with a high internal noise level. If your antenna has resistance 0 ohms like using a balun , this is dangerous for the receiver. If you want to extend the range to VLF just increase the capacitance , in no case you can jumper the capacitor. Yo can go up to 1 microfarad with a NonPolarity capacitor if you want VLF. The decoupling capacitor is to avoid the possible continuous component at the receiver input, but at the same time performs the high pass filter function. When it is short-circuited there is no filter and the sensitivity increases at very low frequencies from DC. Definitely not easy to have both the high dynamic range and low noise floor. Looks like someone cracked the problem.